Loads of fun, laughter and giggles for them. Fully self-contained. You just organise the food and cake. The first 45 minutes includes a mini-disco, with lights, commercial, up to date party music and loads of non-elimination party games. Depending on the performer this could also include a smoke machine, bubble machine. Usually we break for 30 minutes for the kids to have some birthday food and the birthday child to blow out the candles on their cake. Then it’s back in for the fully interactive 45 minute magic and puppet show. The kids get to come up and help out with the magic and have loads of fun, giggles and laughter along the way and the birthday child is made to feel extra special. This ends with a really fun 10 minute puppet act. We also offer a 45 minute magic and puppet show option which is £100 but this is reserved for after-school parties or school shows or midweek parties. 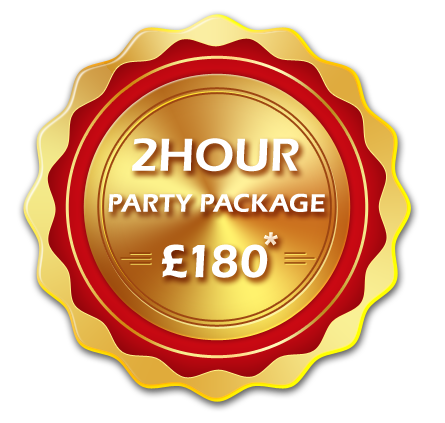 We guarantee that our parties will be a stress-free as possible for the parents and as much fun as possible for the kids. We can adapt our shows to fit with your theme to some extent. In the past we have tailored our shows for Frozen, Harry Potter and Superhero themes, as well as more specialised themes. To read some recent reviews of our shows please click here, or the reviews tab at the top of the page. *£180 Covers Nottingham, Derby and North Leicester. Areas outside of this may be subject to a travel costs. © 2015-2016 Abracadabra parties. All Rights Reserved.